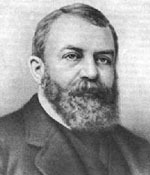 Dwight L. Moody: When I left the ministers yesterday I turned to the 30th chapter of Chronicles. I had thought I had read it pretty thoroughly already, but began to think about it and that circular (call for a Fast Day,) and I found that there was just the same scene enacted 2,500 years ago in Jerusalem that was being gone over in Chicago to-day. Hezekiah had cleared the temple and invited all to come and worship. His father was one of the worst kings Jerusalem ever had. Not only did he set up images for worship in place of the Lord, but he closed the gates of the temple of Jerusalem to all religious services, burned the young children, and through his cruelty was a terror to all. And he was the descendant of David - Jerusalem's king. When he died, after reigning nearly sixteen years, his son Hezekiah took the throne, and the very first thing he did, in the very first year, in the very first month, was to open the temple. It took him eight days to clean it from all its filth and uncleanness, to thoroughly purge it. It would be a good thing to clean out a few of the churches of Chicago in the same way. Clean out the fairs, the shows, the lyceums, the concerts that are held there. "Ah!" some of you will say, "how are we going to pay our debts, set ourselves on our feet: it will be pretty hard to do this, if we put out all our fairs." If there is going to be a revival we must do this, and if there is a revival your debts will soon be paid. I think we have been working in the wrong way. We want more earnestness and fewer fairs. It is said in the thirty-sixth verse of the twenty-ninth chapter of Chronicles that "Hezekiah rejoiced, and all the people, that God had prepared the people, for the thing was done suddenly." (2 Chron. 30:1) "And Hezekiah sent to all Israel and Judah, and wrote letters also to Ephraim and Manasseh that they should come to the house of the Lord at Jerusalem, to keep the passover unto the Lord God of Israel. "For the King had taken counsel, and his princes, and all the congregation in Jerusalem, to keep the passover in the second month. "For they could not keep it at that time, because the priests had not sanctified themselves sufficiently -"
The ministers were not ready, neither were the people, for we read: "Neither had the people gathered themselves together to Jerusalem." So it is with us. We don't see eye to eye, toe to toe, heart to heart; we don't run together like drops of water. When we do the Lord will come suddenly. "And the thing pleased the King and all the congregation. "So the post went with the letters from the King and his princes throughout all Israel and Judah, and according to the commandment of the King, saying: Ye children of Israel, turn again unto the Lord God of Abraham, Isaac, and Israel, and he will return to the remnant of you that are escaped out of the hand of the kings of Assyria." When the faith of this King was seen by the Lord, He turned His judgment from His people, and the sons and daughters of those who had been held in Assyria by reason of their transgression were invited to the sanctuary? And I thought when I read this chapter how the judgment of God for the last sixteen years had been turned against Chicago. Do you remember about sixteen years ago how the spirit seemed to be stirred within us. How, when the war came, we gathered together and how earnestly we learned to pray. It seemed as if the war had done more in teaching us to pray than anything else. But see how we have been afflicted since then. You know how after that, people - Sunday school teachers and all - got a few straws and dollars together, and then they became careless? went out riding on Sunday, and enjoyed the world after their fashion, and forgot God: how the fire came (1871), swept away what they had, and then they said: "We have no time to think of Christ; we must go in and make what we have lost." And then the panic came and made us more worldly, and so we see how we have been turned off the path. No city has had such an experience, and yet it seems to me no city has had such blessings. We had great advantages. Ten years ago you had your theaters shut on Sundays. There was a law against this thing then. Ten years ago the people used to go to church, but now they have their Sunday newspapers and their printed sermons and keep out of church. They read the polished sermons and criticize them. When people look for the qualification of a minister now, they say: "Oh, he's an orator." They don't look at his faith at all - don't ask if he has the Spirit of God. What we want is earnestness and faith in the sermons, and then their power will sweep through the whole North-west. In the ninth verse we read (2 Chron. 30:9): "For if ye turn again unto the Lord, your brethren and your children shall find compassion before them that lead them captive, so that they shall come again into this land: for the Lord your God is gracious and merciful, and will not turn away his face from you, if ye return unto him." They were ground down by their captivity, but if they turned unto the Lord they would find compassion. There may be fathers and mothers in this audience who have sons, now spending their time in the billiard saloons and drinking halls, who have been swept into this captivity by the letting down of our principles and morals. Oh, my God! show us the way to come down to days of peace and purity, and forgive our sins. The posts were sent out all over the country with the proclamation to the people: "So the posts passed from city to city through the country of Ephraim and Manasseh, even unto Zebulon: but they laughed them to scorn, and mocked them." And the people who saw the proclamation laughed at it. Ah, how many men in the North-west, when they see our circular will take it up and say: "What! a day of fasting and prayer; that kind of thing has gone by," and will treat it with scorn. Why, my friends, we don't need to go back 2,500 years to find people who will scoff at a proclamation of this kind. But, thank God, they did not all mock. People came in crowds to Jerusalem to attend the services. Jerusalem was the center of that country; as Chicago is the center of the Northwest. All through Judea the hand of God was seen, and they assembled through its influence at Jerusalem to keep the feast of unleavened bread. (2 Chron. 30:14) "And they arose and took away the altars that were in Jerusalem and all the altars for incense took they away and cast them into the brook Kidron." By the king's faith they gathered there and smote the altars and broke the idols. Let us act like Hezekiah here; let us lead the people by our faith into true worship. Let us be of one mind and spirit - eye to eye and heart to heart for God, and see how quick the blessing will come. Does God act on our ... Prayer by Dwight L. Moody, Edinburgh, 1874. Whatsoever ye shall ask the Father in My name, that will I do ..."Teach Us to Pray" by Billy Sunday, pre-1914.